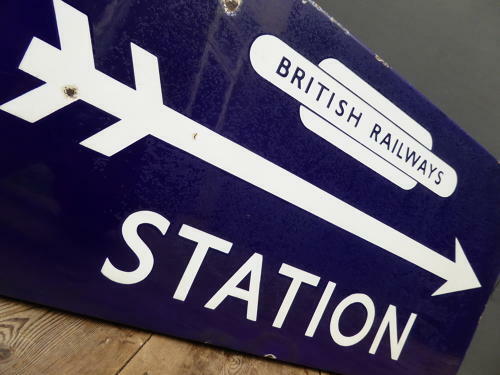 A stunning example of a vintage British Railways 'Station' enamel sign. Featuring both the iconic British Railways logo & also the familiar directional arrow in a beautiful shade of Royal blue enamel denoting its former use in the Eastern region. A wonderful, decorative & seldom seen piece of railway history. Wear commensurate with age, very good overall condition with a few chips & some light wear as pictured. Displays beautifully.